The smell of grass, warming sun, a cooling breeze, just a hint of autumn to come. 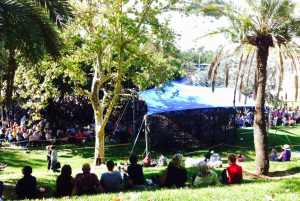 It’s a haven from the mayhem and madness of Fringe, the gentle cadences of intelligent discourse and dialogue a murmuring under the trees. It must be Adelaide Writers’ Week.